Theft and vandalism are two problems that plague virtually every construction site. From pilfering of small power tools to theft of heavy duty equipment, these activities cost the construction industry an awful lot of money. The total value of stolen equipment each year is in the region of £600m and £1b*. This calculates to be between £1.6m and £2.7m a day! – Secure storage may be a very small price to pay. Armorgard are here to here to provide YOU, and YOUR customers with ‘Proven Secure Storage Solutions’, leading the way to a safer and more secure working environment. With a vast range, suitable for every requirement, size and budget, Armorgard have the solution. Together, we can beat the thieves. *The range is so vast due to incomplete theft data, however, whatever figure you pick in this range; it shows that there is a worrying problem. Why do we offer 3 ranges of Tool vaults? 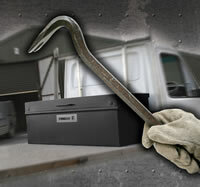 When it comes to securing tools & equipment often different levels of protection are required. This depends on various aspects such as the value of. The brand new, state-of-the-art hospital will be changing the healthcare for many lives in the Bristol area. Carillion are working with the Bristol NHS on the £430m project, which is due for.